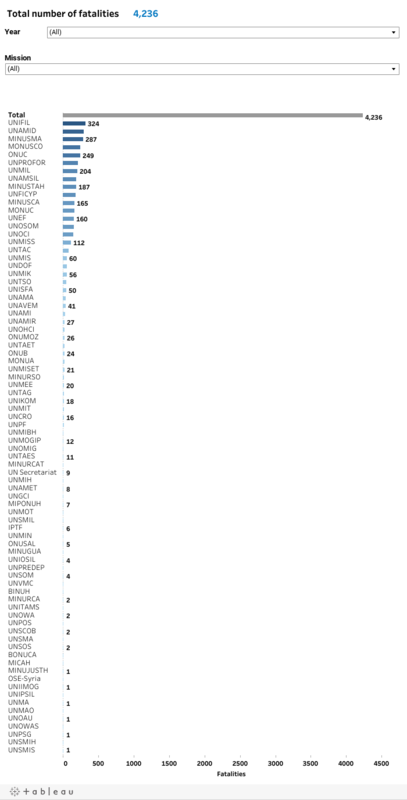 Note the data below covers Peacekeeping Missions and some Special Political Missions. 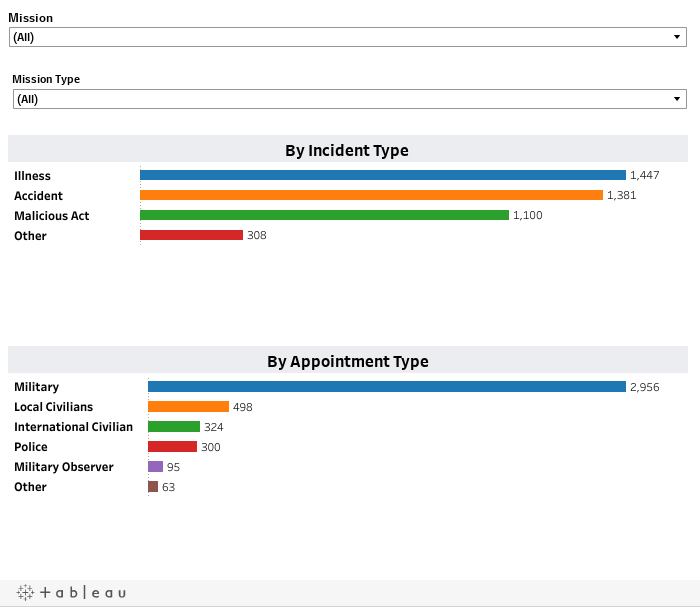 How to use this chart: You could filter the fatalities data by mission and/or by nationalities. If you wish to view the fatalities data of one or multiple mission(s)/nationality(ies), you could deselect the all the available options (by default) by clicking on the square left to '(All)', the first option listed under both Mission and Nationality filters. Click on the option windows to collapse the dropdown menu. 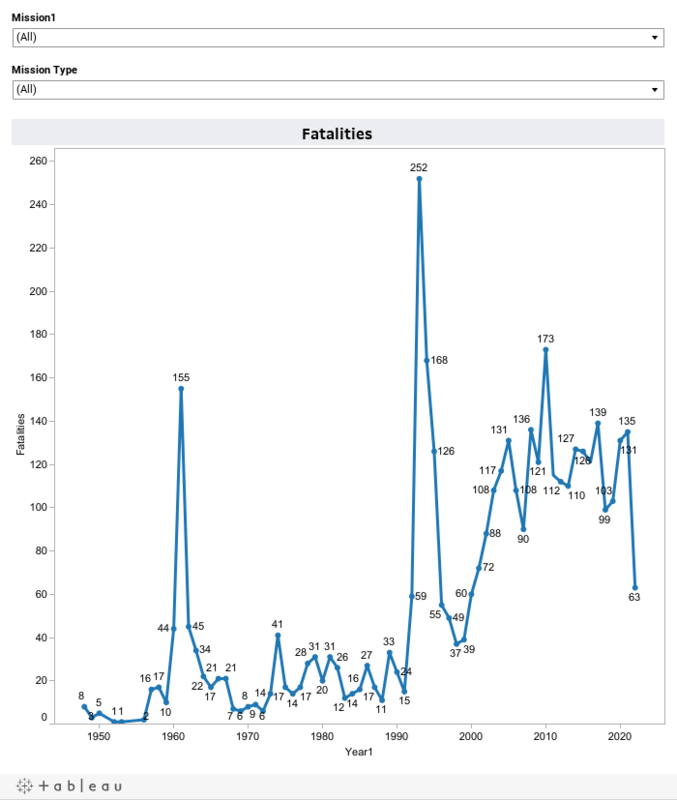 How to use this chart: You could filter the fatalities data by mission and/or by year. If you wish to view the fatalities data of one or multiple mission(s)/year(s), you could deselect the all the available options (by default) by clicking on the square left to '(All)', the first option listed under both Mission and Year filters. Click on the option windows to collapse the dropdown menu. How to use this chart: You could filter the fatalities data by mission. If you wish to view the fatalities data of one or multiple mission(s), you could deselect the all the available options (by default) by clicking on the square left to '(All)', the first option listed under the Mission filter. The filter will apply to both charts. Click on the option windows to collapse the dropdown menu. Statistics based on available UN data covering the period 1948 through 2019. This data is still under review and may therefore contain omissions or errors.